Not too long ago, I didn’t know exactly what prose poems were, but I suspected I’d been writing them for a while. I just assumed they were hybrid poems that emphasized the narrative over the lyrical. Apparently I was both right and wrong. 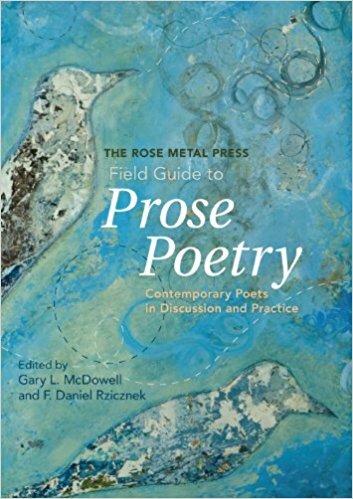 In order to better understand what I was doing or what I could do, I read A Field Guide to Prose Poetry, published by Rose Metal Press. As it turns out, I still don’t know exactly what prose poetry is, but that may be the point–this is a kind of literature that resists category. The book is a good starting point nonetheless, as it introduced me to writers who were doing it their own way. One thing that did surprise me here: prose poems tend to be unlineated. They tend to be poems that look like prose on the page, and not vice versa. Many cite Charles Baudelaire and Arthur Rimbaud as early experimenters. I also went away loving Nin Andrews’ writing, and now I have to get my hands on her books too. Writing that stretches and defies category has always interested me. Lyrical flashes, collaged fragments, memoir disguised as theory, criticism in poetry. It’s often brave and full of surprises. It dismantles and disrupts. It’s inherently queer. Intertextuality as identity, as a reflection of real life. There used to be more, like Sentence, Double Room, and Prose Poem: An International Journal, but all these seem to be defunct now. Let me know if you have any other suggested readings to contribute.